William Cushing was born March 1, 1732. He graduated from Harvard College in 1751, and received an honorary master of arts degree from Yale University in 1753 and an honorary doctor of laws degree from Harvard University in 1785. 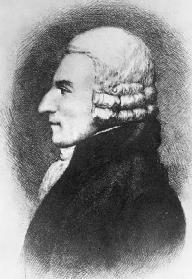 After his Admission to the Bar in 1755, Cushing began his judicial career in Lincoln County, Massachusetts (now a part of Maine), as judge for the Probate Court of that county during 1760 and 1761. In 1772, he served as a justice for the Massachusetts Superior Court, followed by a term as chief justice of that court from 1777 to 1789. "Where [states' rights have] been abridged, it was thought necessary for the greater, indispensable good of the whole." In 1779, Cushing was a member of the first Massachusetts Constitutional Convention. In 1788, he acted as vice president at the Massachusetts Convention, a convention that endorsed the U.S. Constitution. Cushing returned to the bench in 1789 as associate justice of the U.S. Supreme Court, rendering decisions until 1810. In addition to his legal and judicial career, Cushing was active in the establishment of the American Academy of Arts and Sciences and was a fellow of that institution from 1780 to 1810. Cushing died September 13, 1810, in Scituate, Massachusetts.